Figure 01 - Action category "Form-finding"
Why does the command "Calculate all" not calculate the results for load cases with the action category "Form-finding"? The form-finding process in RFEM searches for shapes in equilibrium considering the surface prestress and the given boundary conditions. 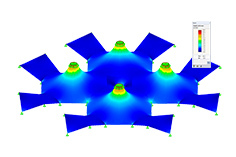 The surface stress for this analysis is defined in the relevant element property definitions. The program can also consider additional loads during the form-finding calculation in load cases defined with the action category "Form-finding". 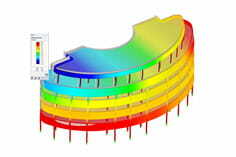 Because RFEM runs the form-finding analysis before the calculation of all other load cases and load combinations with consideration of the form-finding settings in the element properties and loads in load cases with the action category "Form-finding", the calculation of load cases with the category "Form-finding" for the determined shape provides no relevant information for the structure design. The load cases with the category "Form-finding" is provided as only input for the form-finding analysis. The given loads will be "memorized" in the model for the form-finding calculation. Therefore, the command "Calculate all" neglects these special load cases with the category "Form-finding" and calculates only load cases which will be applied on the final shape of structure.